Canine hydrotherapy soothes and relieves the effect of numerous medical conditions that dogs suffer from. 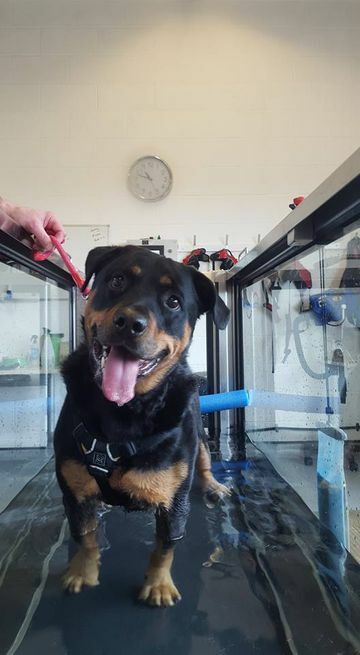 As part of our pet treatments in Great Linford, Milton Keynes, hydrotherapy is a beneficial solution to give your dog the best quality of life possible. For healthy dogs, the treadmill may be used to increase their fitness and stamina. We are the only company registered in the local area of Milton Keynes to provide hydrotherapy, and our services are delivered by a qualified hydrotherapist . Hydrotherapy treadmills have been recognised as beneficial for human conditioning and rehabilitation. 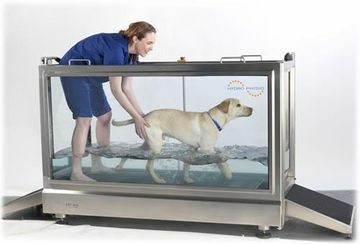 The aquatic treadmill that we use at Fido & Felix is supplied by Hydro Physio™, the leading manufacturers of both human and veterinary hydrotherapy equipment. Once your dog is comfortable and the doors are closed, this versatile treadmill allows a gradual increase of warm water to enter. It is positioned centrally in the room to give all-round visibility, which allows the hydrotherapist to assess your pet’s gait more easily. Contact us in Great Linford, Milton Keynes, to find out more about canine hydrotherapy as part of our pet treatments.